You can read the history of the Dominicans in London from medieval times up to the emancipation here. Following the Catholic emancipation and the influx of Catholic immigrants in the mid-19th century, in 1861, Cardinal Wiseman invited the Dominican Friars to take over the mission at Kentish Town. At first they lived at 20 Fortess Terrace, but within a year or so they had purchased three acres along Southampton Road in a district known as Haverstock Hill, and had the Cardinal’s permission to build a Priory and a Church there. 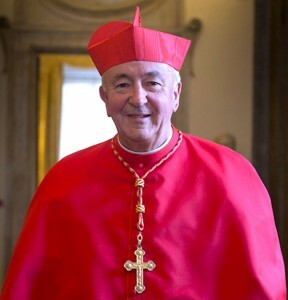 It is said that the Cardinal himself chose the site. On the 6th August 1863, the Feast of the Transfiguration, Fr Jandel, Master of the Dominican Order, blessed the foundation stone. 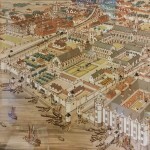 Work must have progressed quickly because by the autumn of 1867 the Priory had been built and a temporary church set up in the Priory, directly above where Blackfriars Hall is now. The current church wasn’t completed until 1883. It was in the intervening period between 1867 and 1878 (when building began), that the design of the Priory Church was developed. A man called Thomas Walmesley from Tunbridge Wells dreamed of building a Church in honour of Our Lady of Lourdes somewhere in England, “to mark the gratitude of the Catholics of the United Kingdom for the many graces and blessings received through Our Lady of Lourdes”. It is to be remembered that the events at Lourdes were still very recent (1858) and so a church built under this patronage would have seemed a novelty. 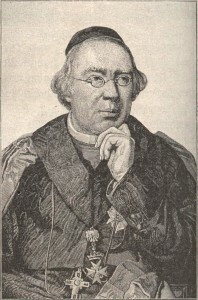 In 1873 Walmesley approached the Dominican Community at Haverstock Hill and they readily agreed. Since the great devotion at Lourdes is the Rosary, the title of the Church would be “Our Lady of the Rosary” and its structure would reflect the structure of the Rosary. Within the Church, there would be fourteen side-chapels each dedicated to a mystery of the Rosary with the final fifteenth mystery, the crowning of Our Lady as Queen of Heaven, commemorated in the stained glass window above the high altar. In a more spacious side-chapel there would be a life-size replica of the grotto at Lourdes. This sanctuary he hoped would become a great centre of pilgrimage and would rival even Walsingham in popularity. He wrote: “all that is needed to make it so is the devotion of the faithful. Prayers can do more than the architect. May our hopes be realised”. 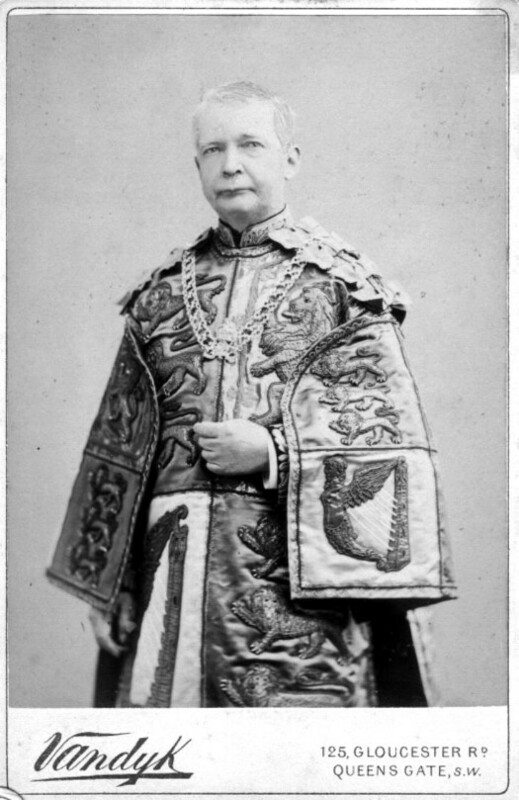 Work began on a church in the ‘Gothic’ style in 1878, firstly under the architect Gilbert Blount (who died in 1876 during construction) and then under Charles Alban Buckler (pictured). Buckler, a convert to the Catholic faith, had the advantage of having no fewer than three brothers who joined the Order and oversaw the remaining construction whilst making some significant alterations to the original plan. His revisions drew inspiration from Dominican churches in the Low Countries. After twenty years in the making, and having cost about £40,000, the vast church was consecrated in 1883 by which time his brother, Fr. Albert Buckler OP, was Prior. One of a number of impressive features of the Church is the side chapels around the perimeter, dedicated to the fifteen mysteries of the Rosary and paid for by local benefactors. Charles Alban Buckler paid for the Chapel of the Annunciation out of his own pocket – a token that demonstrates the fondness he clearly had for this great work. Of Walmesley’s original vision, only the replica of the Lourdes Grotto was missing. For a while the Church did become a place of pilgrimage. For example, in 1895 a pilgrimage was organised for Rosary Sunday with people coming to our Church, dubbed “Our Lady’s Shrine in London”, from all over the city and beyond. Walmesley’s dream of a replica of the grotto at Lourdes was not realised until 1914. The Belton family had been the donors for the crucifixion chapel when the church was built. But in 1912 the same family gave £300 for the chapel and it was used to erect a shrine to Our Lady of Lourdes in the crucifixion chapel. N.H.J. 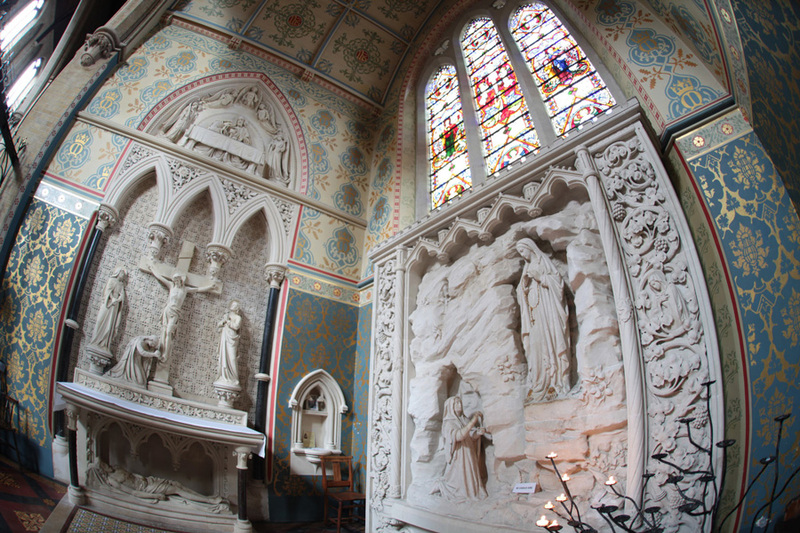 Westlake, a prominent artist of the time, was commissioned to decorate the chapel and under his supervision a small replica of the grotto was erected. 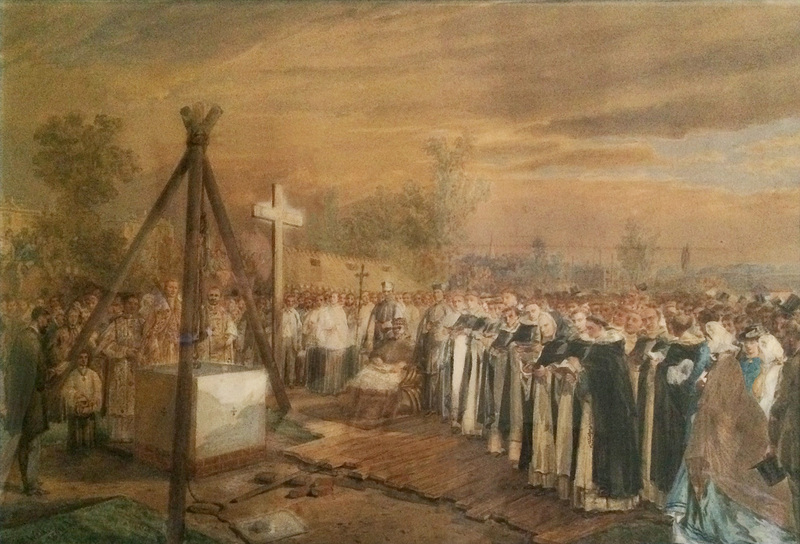 The work was completed in time for the Feast of Our Lady of Lourdes, 1914. Walmesley’s dream had at last been realised. Following the restoration of the chapel in 2002, we can see the beauty of Westlake’s work which had been hidden beneath layers of dirt and grime. The smoke and wax left by candles told the tale of all the years that this chapel has served as a place of prayer and devotion – a realisation of Thomas Walmesley’s dream, and one that continues today. In March 2016, during the Jubilee Year celebrating 800 years of the Dominican Order, the Archbishop of Westminster, Cardinal Vincent Nichols, announced that he would confer on the church the status of diocesan shrine, with a mission to promote the Rosary. This new status is a great honour for the parish, and a recognition of the original intentions of those who founded it. The Dominican fathers hope that this status will attract pilgrims from far and wide to pray within this beautiful and prayerful church.